Prominent & Leading Manufacturer from Chennai, we offer newline trutouch interactive flat panel - ifp's and writing & display boards. UB seriesTRUTOUCHTake collaboration to the next level with a single impressive interactive display. TRUTOUCH lets you experience meetings and presentations on a touch screen that redefines clarity. With multi-Touch technology on a larger scale, TRUTOUCH displays allow multiple team members to work on the screen at once. Simply annotate on images, utilizes a basic whiteboard application and more without needing to download software to any of your own devices. Collaborate with anyone, anywhere no matter what device or system they use. Ultra-High Definition resolution gives your presentations quality clarity. Backlit LED provides the sharpest and clearest image for you to show off your innovation. No need to worry about losing a proprietary pen, just use your fingers. Android system allows the display to be both on-network and safe for guests to use. Comes in 65”, 75”, and 86" screen sizes. 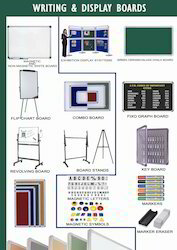 We are engaged in the manufacturing and supplying of a wide range of writing and display boards, which is widely used in bus terminals, defense installations and Announcement & music. Our range of writing and display boards are manufactured using quality raw material which ensures the durability and reliability at clients' end.